If Pink Floyd's three remaining members are to perform together again, Glastonbury could be the place. 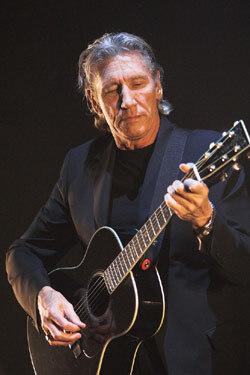 Appearing together at a Pink Floyd exhibit in London, Nick Mason and Roger Waters sent a clear signal to their guitarist that they are open to the idea of playing the festival. As has Peter Gabriel with Genesis, Gilmour has been the hold-out on reuniting Floyd. Asked about the prospects of them getting together again, Mason said, 'It would be nice to add that to the list of things. I've never played Glastonbury. It would be fun to do.' Worth noting, he also added, 'I don't think it would be very likely.' The three last reunited 5 years ago at the O2 Arena in London. In 2015 Gilmour admitted that he a Waters developed a strained relationship, saying, 'Roger and I don't particularly get along. We still talk. It's better than it's been. But it wouldn't work' when asked about performing or recording together.